Almost 4 years ago I made a trip out to St. Louis from Bangalore to visit sis. This was not just any visit - we were meeting after a whole 5 years and remember, this was before either of the two squirmy tykes were born, so we had a bucket load of events and outings planned. One among them was a free linoleum carving workshop conducted by Blick the art store. I was really looking forward to it because - for one thing, it had been an age since sis and I crafted together, plus this was something completely new to me. Why, I'd never even seen a lino sheet before! So in short the workshop consisted of cutting a piece out a lino sheet on which to carve the stamp, drawing a picture of the stamp, marking the areas to be carved, using a lino cutter tool set to gouge out marked areas and finally using paint to impress the carved shape onto paper. 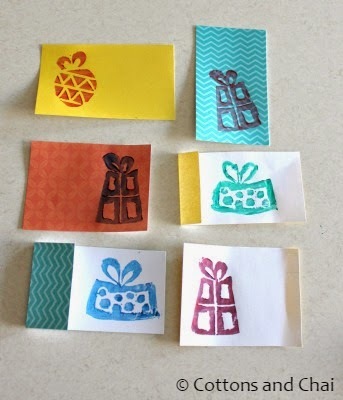 We really enjoyed the process and thought it was a neat way to make long-lasting stamps. (I've carved potato stamps before and since they're perishable felt quite sad while cutting them up for fries - kidding!). So sis ended up buying and gifting me a lino sheet and my very own lino cutter set. 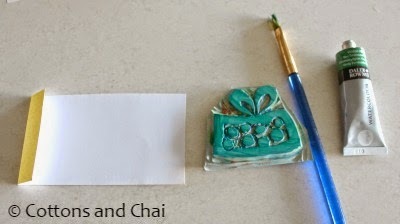 And now that the season of gifts is here, I thought of writing up a post on carving a stamp that can be used for making gift tags for any present, throughout the year. 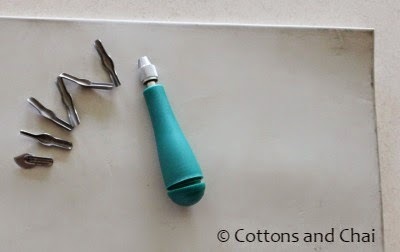 I started with my linoleum sheet and lino cutter set that comes with interchangeable blades in different sizes that can be stowed away inside the hollow cavity of the tool that unscrews at the bottom. Then using regular scissors I cut a piece of lino about 3" * 2". The lino is pretty soft to cut into. 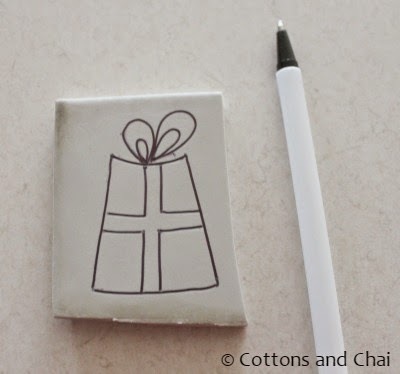 I drew the picture of a present with a ball point pen. Using an appropriately sized blade, I gouged out parts that I did not want impressed. I had to change to smaller sized blades the closer I went to the markings. Similarly I made a couple of more stamps. 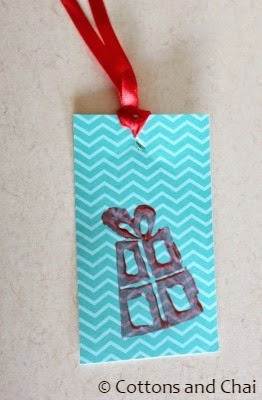 Then painted the stamp with watercolor and pressed it onto a paper cut to gift tag size. Here's my collection of colorful little gift tags. I punched a hole at the top of one and threaded a ribbon through it. 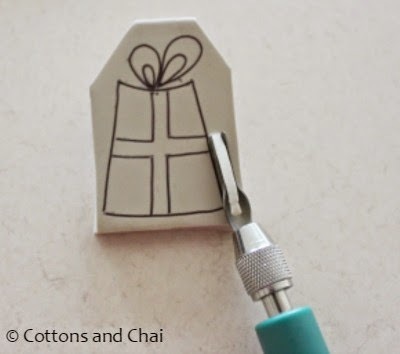 Gift tag all set to go atop a present! A couple of years ago I had a party favor order for which I sewed little purses with printed fabric on one side and plain off-white fabric on the other. I carved a few stamps and applied fabric paint on them to stamp on the plain side. 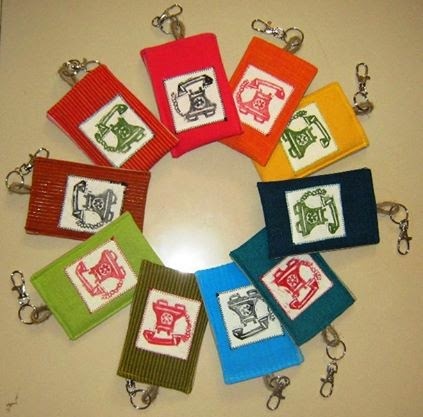 I'd also carved a quaint rotary dial telephone to make these contemporary mobile phone cozies. Well, that's it for today then. I have travel plans coming up next month, so we will be on a little hiatus. 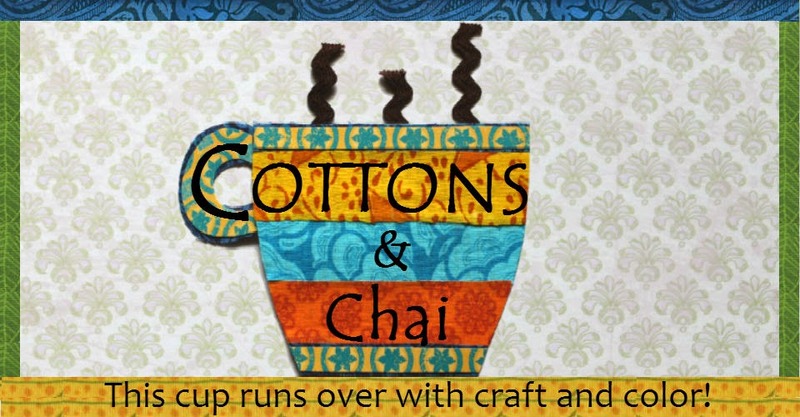 But we will be back in January with lots of craft and sewing. Until then, here's wishing everyone a wonderful Thanksgiving and happy holidays! Kashmira, another awe inspiring art work. 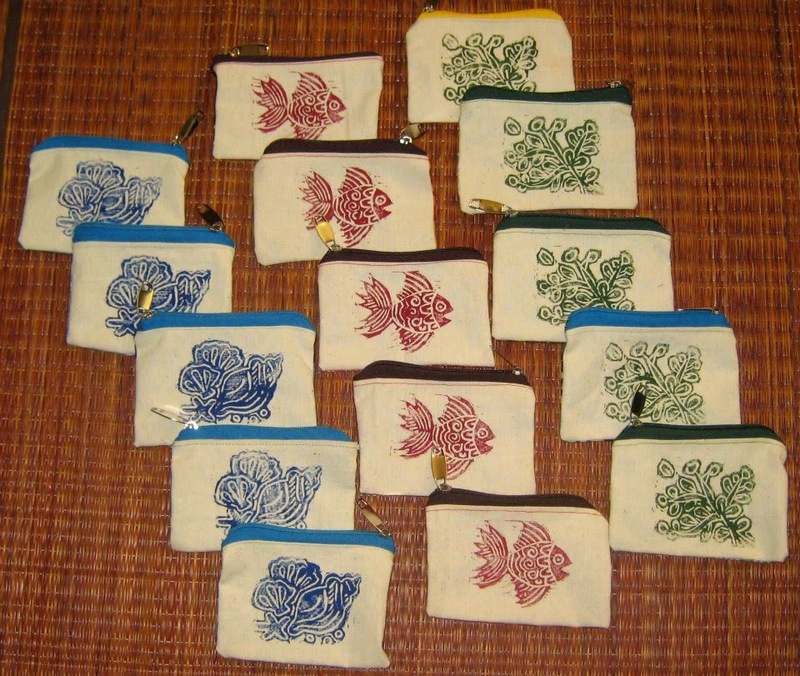 I loved the intricate stamps on those little purses and the phone cozies too. If you plan to start your business here, I would love to order your creations. Please do! Priti- Thanks as always for your kind and encouraging words! If you'd like us to do a custom order for you, we'd be delighted to. Just drop us an e-mail!